What is Pet Odor Eliminator? Pet Odor Eliminator is a bio-enzymatic, biodegradable solution that effectively removes both new and old odors from surfaces such as pet beddings, carpets, rugs, furniture, upholstery, clothing, draperies, car seats, and more. The all-natural cleaner is available in a 12 oz spray bottle. How does Pet Odor Eliminator work? Pet Odor Eliminator contains a bio-enzymatic odor remover that eats away the organic residue that causes odors. It removes both old and new odors. Organic deposits in carpets result from common stains or spills and lead to odors. 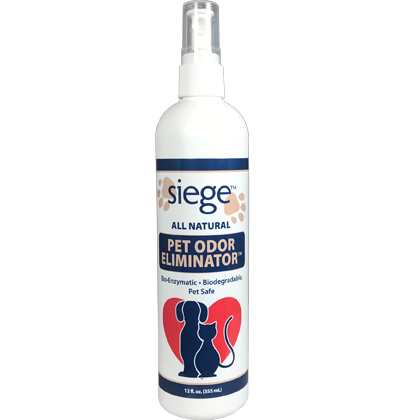 The Pet Odor Eliminator degrades these organic materials, which eliminates the odor. Shake the bottle well and spray onto any areas that smell. Let dry and brush the area lightly. Do not use on silk. Do not use on pets.